Sliding miter saws let you crosscut wide boards while still offering all the features of a non-slider. This guide talks about the factors you should consider when shopping for the best 8 1/2 sliding miter saw. A good sliding miter saw is a useful addition to your workshop. An 8 1/2 sliding miter saw is a worthwhile addition to any workshop, giving you the extra cutting capacity to work with double-wide crown moldings, baseboards, and such. Sliding miter saws come with blades ranging from 7 1/2 to 12 inches. These are not the lightest of saws. But while some models are permanently mounted, there are portable ones that you can lug around if you need to. According to The Spruce, miter saws are typically made of steel or aluminum. Dragging a heavy miter saw around can quickly tire you out and even damage your back, shoulders, and arms. An 8 1/2 sliding miter saw with a compact and lightweight design is a practical option because you can easily carry it around your home or on a job site. A portable miter saw with a top carry handle is perfect for room-to-room jobs like wood floor installation, deck building, and baseboard installation. You don’t need a sliding miter saw with all the bells and whistles. What you want is a tool that you can operate without having to pore over the manual. Look for a sliding miter saw that is easy to use, with intuitive controls, bevel and miter scales that are easy to read, and blades that can be changed quickly. An ambidextrous trigger switch is the safest option because it lets you operate the saw whether you’re left- or right-handed. Look for a miter saw with a large trigger switch and a lock-off button that is easy to press. Some people prefer saws with switches that don’t have a lock-off button. You’ll want a sliding miter saw that has a comfortable handle, especially if you’ll be using the tool for long periods. Look for an ergonomic, preferably rubberized handle made from the vibration-reducing material. Test the grip, the cushioning, and the fit of the handle to be sure you’ll be comfortable using it. Unlike larger stationary saws that have wider surfaces, your 8 1/2 sliding miter saw has a much smaller base. Solid steel extension arms expand the base of your saw and let you work on bigger pieces. Depending on the brand and model, sliding miter saws can have extension arms that stick out between 6 to 9 inches from each side of the table. These extension arms can be left off when you don’t need them. Consider portability, ease of use, effective dust collection, and ambidextrous switches, among other things. A laser guide allows you to make exact cuts without having to make marks on the board. 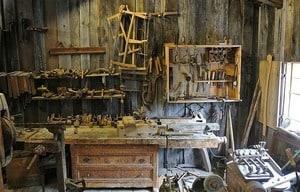 But as veteran woodworkers will tell you, a laser isn’t always necessary. For one thing, these laser markers aren’t always accurate enough to mark the cuts needed for exacting trim work. Also, a laser marker may be a nifty feature, but you typically won’t be able to use it if you’re using the sliding miter saw outdoors in daylight. When you use the laser guide indoors, you’ll be able to see a bright red line marking where you’re going to cut. But when you use the laser guide outdoors in bright sunlight, you’ll hardly be able to see the red line because the sun’s rays hide the laser’s red beam. If you want to use the laser marker outdoors, you’ll need to wear red-tinted safety glasses. Unless you’re comfortable doing this every time you use the saw outside, you’re probably fine without the laser guide. Many 8 1/2 sliding miter saw models have laser markers. If you will be using your miter saw indoors most of the time, go ahead and buy a saw that has the laser guide. But if you will be using the saw outdoors, the added cost of the laser feature may not be worth it. Single bevel or double bevel saw? A sliding miter saw with a single bevel is sufficient if you are an expert woodworker and know how to cut. It can do all the cutting work that a dual bevel saw does. However, a saw with a dual bevel lets you do the work faster because you don’t have to reorient the workpiece you’re cutting to make opposite bevels. In short, a dual bevel saw saves you time and effort. Dual bevel saws do cost more than single bevel saws, so you’ll have to think about how important this feature is to you. You’ll be able to do your work faster and safer if you don’t have to lift the blade guard every single time you line the blade up to make a cut. Look for a saw with a blade guard that offers good visibility. Some models have blade guards that are completely transparent for greater visibility while some have notches on the guard so you can see through. Miter saws are some of the messiest tools you can have in your workshop. To minimize dust and particle accumulation in your work site and make cleanup easier, your sliding miter saw should come with a good dust collection system. 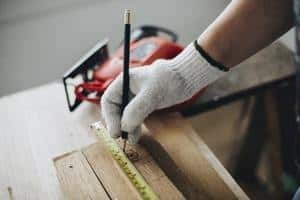 A good dust collector will also help prolong the life of your saw by protecting the interior components of the tool from dust and grime buildup. 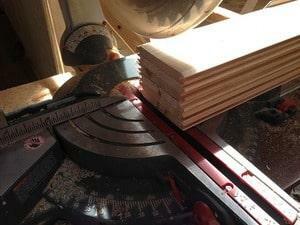 When choosing a sliding miter saw, make sure that it catches the chips and sawdust from your workpieces. The dust bag should not dump its contents out when the saw head is tilted. The blade channel should have slots that let the dust drain out so you don’t have to vacuum or blow it out. Ideally, your sliding miter saw will last years before it needs servicing. But to be safe, you’ll want to go with a brand that is well-known enough to have authorized service centers in your city or near it. You also want to make sure that the saw comes with a warranty that includes service as well as parts. Hitachi produced one of the first modern sliding miter saws, so it’s no surprise that this works exceptionally well and is a true workhorse. It doesn’t have as many features as the other two miter saws we review in this guide, but it does have a powerful motor that makes good quality cuts, a decent dust collection system, a saw blade perfect for delicate trim work, and a large table and clamping system for keeping your pieces lying flat. The saw runs smoothly, has a soft ergonomic handle, and intuitive miter stops for fast miter adjustments at common angles. At just 31 pounds, this is one of the lightest and most portable sliding miter saws you’ll find on the market and is the lightest of the three saws reviewed in this guide. At just 31.1 pounds, the Makita miter saw is also very lightweight and portable, letting you move it around easily. The motor is a direct-drive that allows for smooth activation and feels good overall. The electric brake Is fast but gentle. This sliding miter saw has removable extension arms that extend 9 inches from both sides of the table. There’s no laser, though the LED light built into the saw helps with accuracy. A dust slot in the blade channel funnels sawdust out. All in all, this is a great saw that offers plenty of power and good cutting accuracy. It’s easy to use, works smoothly, looks great, and feels very ergonomic. Laser guides help with accuracy but are only useful indoors. Weighing 37 pounds, this miter saw is the heaviest of the bunch. But what it lacks in portability, it makes up for in performance. The Bosch CM8S miter saw has a ton of nifty features, including accessible trigger lock-out buttons, an ambidextrous saw handle, and an integrated expanding base that extends 29 inches on both sides of the saw table. It has a good dust collector, a scrap deflector, and a ramp that keeps the blade channel free of wood chips and sawdust. There’s also a miter detent override and a transparent blade guard for better visibility of the saw in action. This is the priciest of the trio but it does feel like a well-built machine. Trying to find the best 8 1/2 sliding miter saw to suit your needs? First, you need to figure out what you’ll be doing with your saw and how portable you need it to be. We hope the guide above helps you get what you need.